I am using a ZDZ 80 swinging a 24 x 10 three blade. The muffler is a cut-up Bisson. Its tight in there! If I had to do it all over again I would put in a 3W75. Best motor in it's class. The ZDZ runs a little too hot due to the high compression design of the motor. BTW, I have removed over a pound of lead in the nose and she never noticed it was gone. Mine is framed up and ready for sheeting, did you guys get anymore flights this summer, any more thoughts about this bird. I have in mind to buy it. Please what OS or Evolution Engine could be ok in it? Hey guys I sure could use some help on setting up the CG on my Ziroli Spit. I have invested almost two years in the build and it looks great. Problem is it is calling for over 10 pounds of weight in the nose. I can't jam that much weight into it. I used latex paint on it and I may have used 1.5 oz.cloth in all the fiberglass work which I guess is causing the problem. Any ideas would be most welcome. I am thinking the only way out is to build another fuselage. Has anybody else had this problem? I even made a spinner backplate from 1/4" steel plate and that still did not help much. I have a Taurus 4.4 engine in it. I will weigh it again tomorrow and post it . I have been dealing with this problem for days and have so many weight figures in my head I truly don't remember. If I might ask what spinner did you use on your spit? I have been building models for quit some time now and use established methods so I was really surprised at how this turned out. At this point I think I have a really nice static display bird. I am shooting for a CG of five inches behind the leading edge of the wing close to the fuselage. I also balanced at 5" with wheels up and upside down. I am using a carbon fiber spinner from hobby king, not very heavy . I also had a nice scale tail wheel but opted for a simple wire one with a small wheel to save weight in the nose. I blew $90.00 for a real cool looking tail wheel also but it weighs two ounces so I took it off. 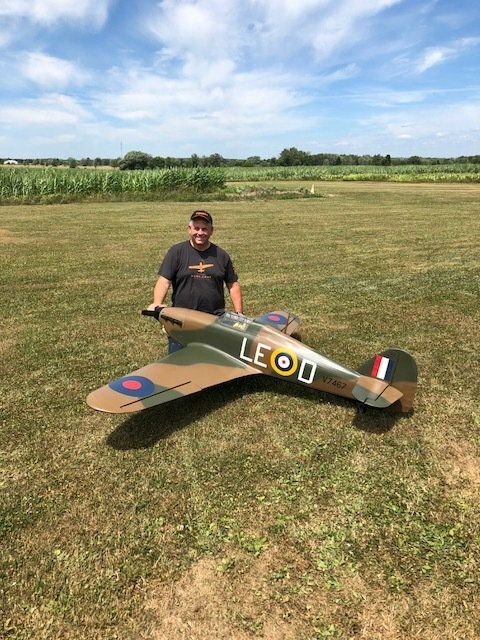 The reason I asked about the spinner is because I refused to buy the one made by tru turn for $200.00, instead I used the one offered by Dave Platt for his spitfire. It is a perfect fit and I think I paid only $40.00 for it. As I stated before I piled on 10 pounds of lead on it and it still would not balance so I stopped --thinking I had to be doing something wrong. I also pulled the full figure pilot out trying to save weight. Results are in. I weighed the Spit and it weighs in at 33 lbs and 1ounce. That is ready to go except for ballast. After piling on 10 pounds of lead and still not achieving the correct CG I stopped to regroup. I am not sure if I can save this thing or not. I would like to know if anyone else has required this much ballast. Bird guy your Spit looks great and so does mine but the difference is yours flys and mine does not. Not sure where to go from here. Looks like I came in three pounds more than yours for some reason. I did a full cockpit with a full figure pilot but it looks like you did the same. I don't think I was heavy on the glue and epoxy but either way it is what it is. Any suggestions are welcome. I am building the Mk 1 version of the Ziroli Spitfire and came across your beautiful job on the P9374. 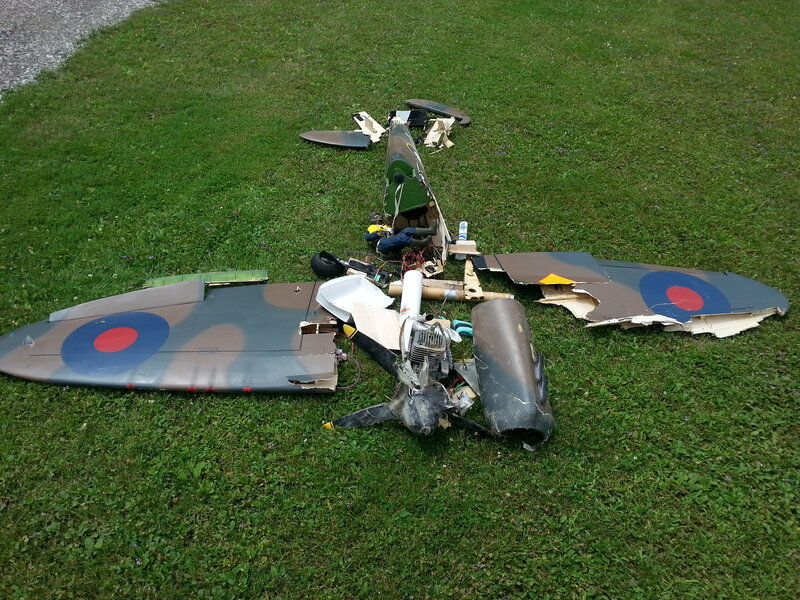 I am scaling mine to this Spitfire as well. Could I ask a couple of questions? i can't see if you used the flap door hinge design Nick outlined in his plan - on the top of the wing. Do you have any other pictures of the bird? I am powering mine with the 3W 85 XI and Soar WWII 24x10 three-blade prop. ESM retracts (Chinese Robart knock offs but less expensive and functional) I was thinking of latex paint but perhaps the Tamiya spray paint. What paint did you use? I am very aware of building the tail as light as possible. I will use 1 oz fiberglass cloth, Z-poxy finishing resinIt looks like your AUW is 37 lbs? That should translate into a nice flying bird! How are the flight characteristics? Thanks for any suggestions you can throw my way. 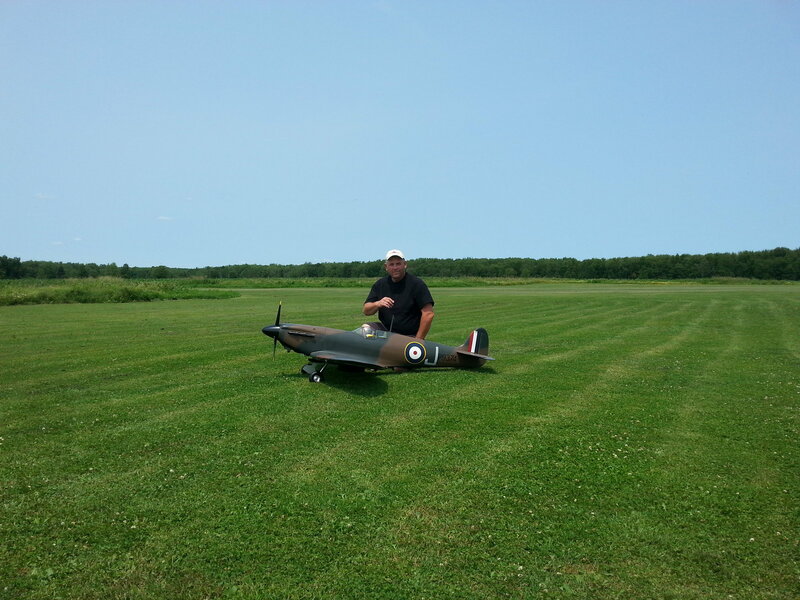 This is my first scratch built plane, but I have been in the hobby for 50 years... I've built and fly the 1/3 scale BSA Super Cub and the Sig 1/3 scale Spacewalker. I have built the Yellow Aircraft and Pica 1/5 scale Spitfires as well. I had a couple more flights and then the horizontal stablizer fluttered and came off. no control left with no tail and She basically be came an 85cc lawn dart . Before that it was flying well. previously my neighbour had damaged the tail by stepping on it while he was holding it for me. I think my repair job was not the best and thats what caused the flutter. Live and learn. I could not get the flap doors to work properly so I did not add them, paint was latex paint which I love, Tamiya is great put far to expensive, I used a Dle85 and flew 1/2 throttle most of the time. no bad characteristics. I would consider building another, I put the gear in a Tony Nijhuis Hurricane. Beautifully made both models. Congrats on that.